NICE MONTOURSVILLE BUILDING LOT WITH ALL PUBLIC UTILITIES TAT THE CURB. STOP BY AND TAKE A LOOK AT THIS GREAT OPPORTUNITY. CALL SCOTT YEAGLE @ 570-220-3298 WITH ANY QUESTIONS. Excellent opportunity for hunting, farming, raising livestock, or riding ATVs, 75. Beautiful home on a large corner lot with a built-in pool. So many great features to this 3BR home! Large master bedroom with sitting area. 4 levels of living space. Updated kitchen with stainless appliances and granite counters. Sunroom and covered porch. Large lower level family room. Crow's nest that could be a 4th bedroom or den. Move-in ready, spacious open floor plan, 3-bedroom, remodeled with granite countertops throughout and newer cabinetry in kitchen. Beautiful lower level family room with wet bar and fireplace. Additional coal stove is included. Entertain on your covered trex deck and huge patio. One-car garage w/electric and extra carport, exterior storage under deck. Additional lot goes with the property. Come see this affordable 1 bedroom apartment in Lock Haven. The 2 level unit is newly painted and ready for a new tenant. The main level has an open living room and kitchen with lots of cabinet and counterspace. The second floor has a large bedroom, closet area, and a large bathroom with a tub and lots of shelving for storage. Pets welcome for an additional $25 per month, per pet. Your Dreams can come true!60.58 acre farm complete with bank barn and outbuildings. Large pasture for horses and livestock, 35 acres currently leased for cash crops. Beautiful new large kitchen, hardwood floors, first floor bedroom and laundry. Property has road frontage on both Sulky Road and State rt. 442 that would make possible building sites . Bring your dreams to the FARM. .
2.7658 acres available in the I99 Business Park conveniently located off of the I99/RT15 & RT 6 Interchange. Great place for your business w/NG, electric, public water/sewer, phone, cable, & high-speed internet available w/infrastructure included. Do you want seclusion and woods? Then here it is. 16.6 wooded acres off of Lambert Hill Road. Access is through a 700' long lane to the main property. 50% of the oil, gas and mineral rights convey to buyer. READY TO BUILD? 40 acre mostly wooded parcel offers 2 wells, 2 electric services, and septic. Creek through the property too. Endless possibilities! Athens Schools - Bradford County PA. Great spot for your new home or camp. Dream property for the hunter or wildlife enthusiast. AWESOME HOME--BRIGHT AND CHEERFUL WITH LARGE ROOMS, HARDWOODS FLOORS AND SUPER VIEWS. CLOSE TO TOWN AND COLLEGE ACTIVITIES YET NEAR RECREATION AND THE GREAT OUT DOORS. CALL NANCY TO SCHEDULE YOUR PRIVATE SHOWING. 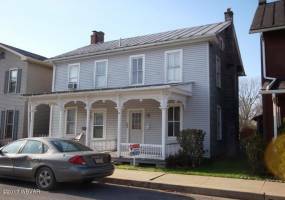 Nice second floor apartment with eat-in kitchen, living room, and 2 bedrooms with common use of deck and basement laundry in Loyalsock Schools. Location just North of Williamsport behind the Crippled Bear Inn. Rental application and credit check required. Call Chris Wallace for details, 570-220-2897.